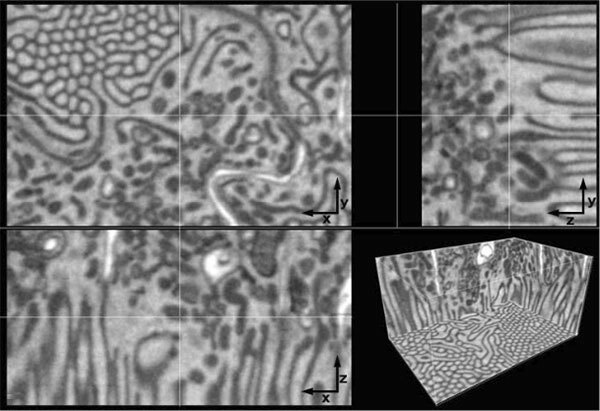 With the Gatan 3View system you can image your samples in 3D with a remarkably fine depth resolution on an FE-SEM (Field Emission Scanning Electron Microscope). Using serial block-face scanning electron microscopy (SBFSEM) technology, you can acquire the 3D ultrastructure by automatically sequentially imaging a freshly cut, resin embedded block-face. Unlike the light microscopy 3D techniques, the spatial resolution in the Z direction is comparable to the X,Y resolution and does not degrade with depth. Minimal errors and distortion compared to focus ion beam imaging or traditional serial section imaging. Precise stage motion – image multiple regions without losing data. 15 nm Z section thickness without the need to unblur multi-kV images. Fast imaging at low kV without compromising image quality. Biological samples should be prepared in a similar way to a microtome protocol optimised for TEM. The sample is then fixed, stained and embedded. This method ensures that the sample’s integrity will be maintained for hours while it’s being imaged. Mouse kidney embedded in Durcupan resin. Imaged with 7 nm pixels. Cut with 7 nm cuts creating 7 nm isotropic voxels. Set-up and operation is simple. 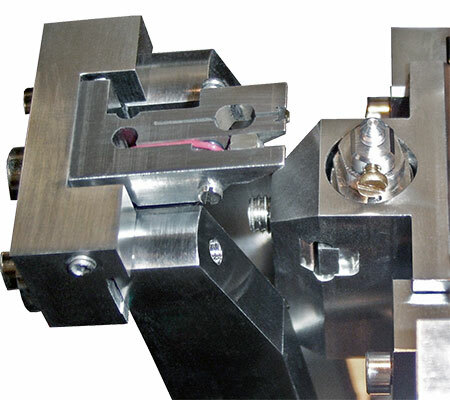 First remove the standard stage from your FE-SEM by venting the chamber. This is then replaced by a 3View specific to that microscope. This ensures stability over long sample runs. Cut step size can be 5 – 200 nm to isolate and collect distinct sample features. Diamond knife cutting speed can be 0.05 – 5.0 mm/s to prevent artefacts and accommodate different sample types. Number of images collected can be hundreds or thousands in a single run. This depends on how much material you want to section through. The maximum sample depth is 600 μm (Z). Images are acquired from the block-face, rather than the sections. They are captured using a Gatan backscatter detector specifically optimized for high signal collection at low accelerating voltage. Sample charging is unavoidable, because the sample is embedded in a non-conductive resin or epoxy. The best way to deal with this is with a variable pressure SEM and low accelerating voltage. Top: Segmented dendrite in green with synapses in yellow & synaptic vesicles in red. 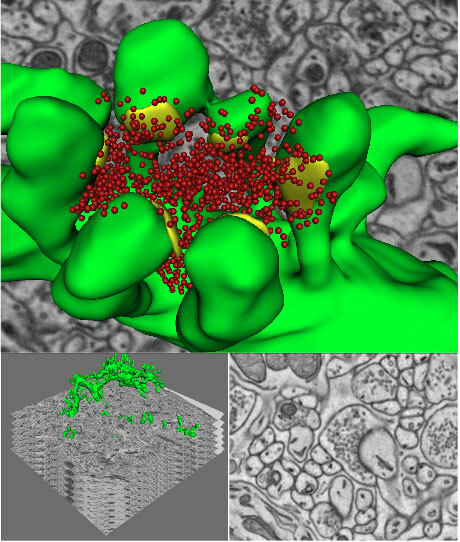 Left: Selected serial images with the reconstructed dendrite in green. Right: Single SBFSEM image of a dendritic spine, synapse and synaptic vesicles. Courtesy of Tom Deerinck and Dr. Mark Ellisman, National Center for Microscopy and Imaging Research, University of California.